Located in the beautiful southern region on the River Dart, Totnes is a town with an interesting and rich history. Like many towns on or near the coast, Totnes is home to a Norman-built castle that overlooks the town. Also like other towns with a similar history, this is a “market town” with a wealth of independent shops that serve the local residents as well as visitors. Butchers and greengrocers still survive here and sell local produce to the townsfolk. As the premier hog roast catering service in Totnes, Taste the Cracklin know how important good food is to the enjoyment of life. We also like to source the freshest meat and produce available, so it is always encouraging to see the survival of local food markets and shops. The town plays host to an annual agricultural show every July where the best examples of local agriculture can be seen. The nearby vineyard and cheese dairy complete the picture of the town as a haven for foodies and for people who appreciate the importance of fresh and local fare. These are all reasons that we love working in the town because it is a great feeling to cater for people who really know and love good food. Our catering service is just a little bit special because when we come to your event, we cook the food right on site for you. A large part of the joy when hiring Taste the Cracklin’s hog roast caterers is that you get to see the meat slowly cook before your very eyes. Of course, we can cook the food in a separate room if you prefer, or arrive with it prepared, but that is also part of the great service that we provide – we can adapt to your specific wishes. Our catering style can really make your event a one-of-a-kind affair that people will talk about for years to come. Lots of people like to know where their food comes from and to feel connected with the food that they eat. This is really possible when, instead of processed food, you get to see a whole pig, lamb, chicken or turkey being cooked to succulent perfection right in front of you. The concept is simple yet brilliant. Our excellent chefs will also cook sides and sauces to go with the meat that you choose. We have set menus that pair our meats with traditional accompaniments but we can adapt to fit your needs, so if you don’t see what you’re looking for on our website then just give us a call and tell us what you’re looking for; chances are we will be able to work with you and create something really special. The wonderful thing about catering is that you don’t have to worry about a thing. Once we agree upon a date and a menu you can rely on us to sort everything out. We will source the freshest ingredients and prepare your food to the highest possible standard. We provide plating options to suit every taste and budget. 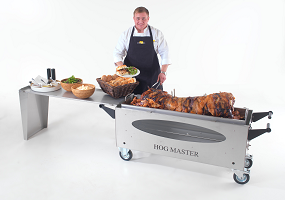 Whether it is pork sandwiches on paper plates for a casual barbecue-style gathering or a sit-down meal for over a hundred wedding guests, we can make it happen. We can bring silverware and crockery, glasses, alcohol and other drinks. Just be sure to let us know exactly what you want and we will include it in our quote. If you have ever experienced delicious meat cooked on a spit roaster then you may have the desire to try your hand at this unique and impressive cooking style. We can get you set up with everything you need. We can even provide the meat if you wish and you can be sure that we will go over the cooking technique with you to make sure that you can get the best out of the machine when you rent it. That’s why we are the hog roast experts that people come back to again and again. We love what we do, we consistently cook fantastic meals and we want to make people come back for more. Call us today to find out how we can cater for your next special event or occasion.